Just when you thought it was safe to go back onto the internet, Glam Polish comes out with more shimmering beasties for us to lust and pine after. Today I have six devious shades from that collection, all inspired by some of my favorite holiday classics. The is a cranberry leaning magenta jelly jammed with warm shifting flakes and fuchsia microflecks. The flakes in this collection are crazy-pants, guys. This one is so super full of shimmering shinies that it glows and reflects light in every possible lighting. I used two medium coats plus a layer of Seche Vite (because my Magic Shine has vanished) for these pictures, but I think I would be happier if I did three extra thin coats next time. An added bonus: no staining! I tested this on my thumb and it removed cleanly without a hint of color. This vibrant violet glows mysteriously thanks to all of the tiny purple flecks that ever existed in the history of ever. 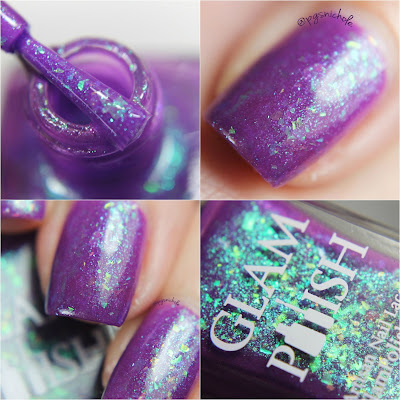 Sixth Sense has a slightly more delicate dusting of iridescent flakes, but they are still up front in a good light. While I was taking pictures, I paused to attach my macro extension and I spotted a definite shift behind the bright violet that reminded me of Fantasy Fire...but I couldn't catch it with my camera. I used three super thin coats + Seche Vite here, and I think it was the way to go. All the flakes dispersed evenly, and the added coat helped amp up that glow. 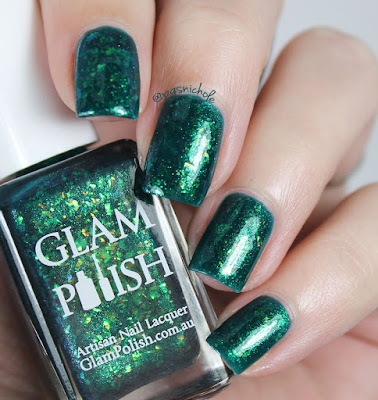 This complex shade is what would happen if a lab created emerald and an opal had a crazy lovechild. It is a deep, shimmering emerald leaning teal. It has an insane amount of flakes inside. 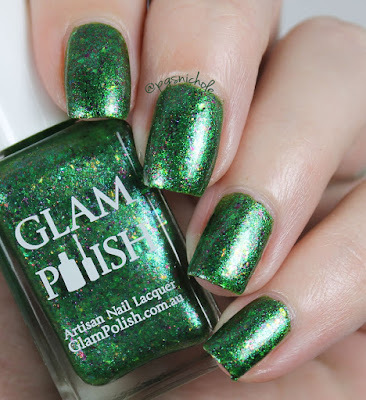 In addition to the obvious gold-green lizardish flakies in the front, there is some gleaming shimmer in the back...reflecting light and majesty all over. The formula is Goldilocks level, and I used two average coats + SV for the pictures below. I tested this one on my thumb since I am prone to staining from shades like this...and again I am happy to report that my nails came away without a spot. One thing to be aware of for a few of these shades: they have that skunky smell. You know the one...that Oh my aren't you pretty skunky scent. I have definitely developed a Pavlovian response to that particular scent. Do you like electric lavender? You know that I was sold the minute I saw this one. I adore the aqua/purple combo here. Scream has a jelly-ish formula that perfectly supports a horde of aqua shifting flakes and pinky-purple microflecks. This is another one that shows a different face depending on your lighting and angle. I used two average coats + SV here, and I was good to go. There is something about this shade that makes me want to pet my nails here...thats normal, right? Who said bright colors were only for summer? A fool, thats who. 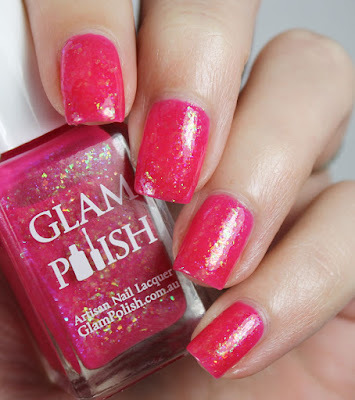 This cool leaning hot pink is perfect for fall. It has warm green/blue flakes and is perfectly smooth and opaque in two coats. I know I have a lipstick this color somewhere...I might need to wear them together. This one is also a wee bit on the skunky side, but I find myself giving no fucks at all about that. The color is just amazing. 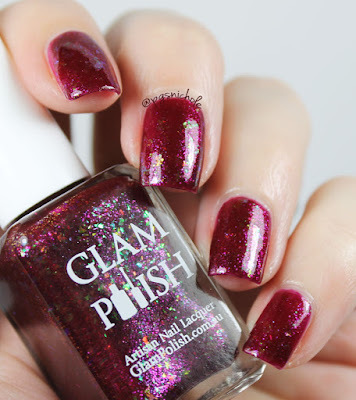 I admit that I cackled a little when I saw the name of this polish. It definitely looks like something from the movie...if the movie were acted and written entirely by unicorns. 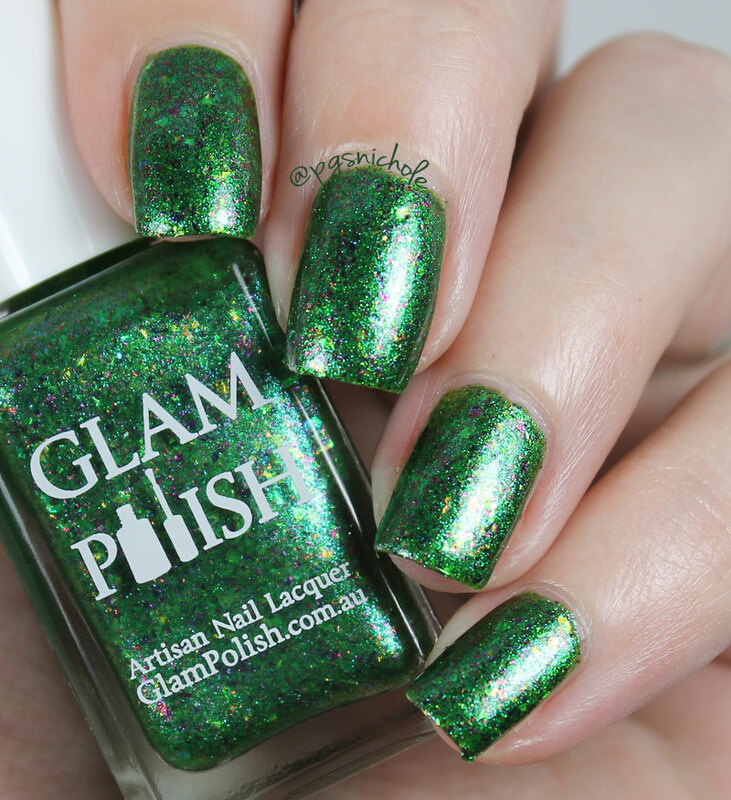 This warm grass green shade is full of multicolored flakes, possibly multichrome, blue microflecks, and shifting iridescent flakes. I guess Glam decided to go all in for this one. I used three whisper thin coats for the pictures below followed by a thin layer of SV. I think, of all the shades I tried in this collection, this will be the one that will be able to dance through Xmas without arousing any suspicions. This collection is a show-stopper kids, no question. I am excited for Halloween, because if this is any indication we are going to have a frighteningly good season. 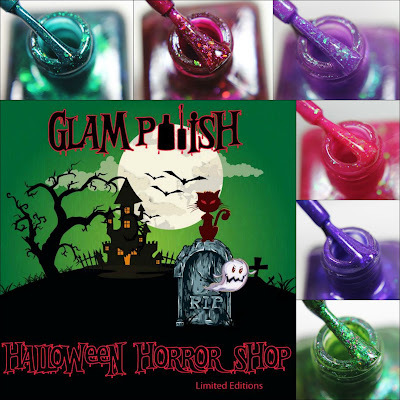 ►All shades feature: 15 spooky shades limited edition shades with mixes of shimmer, glass flecks, metallic and opalescent opalescent flakies. ►Very Limited quantities of only 30-60 bottles per shade will be available, these shades are exclusive to our website and will not be available from International Stockists. 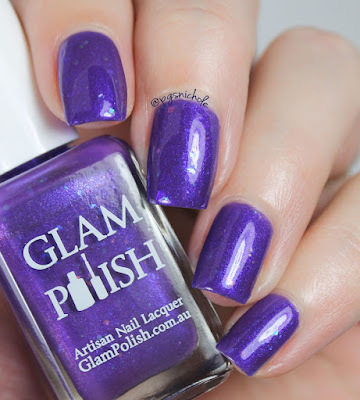 ►Release Date: Friday October 2, 2015 exclusively from www.glampolish.com.au with shipping to Australia, USA and France - shipping rates to USA are $3.50 USD for the first polish and an extra $1.00 for each additional polish. If these look like something you need (and trust me, you do) then I would set an alarm...because like the buxom heroine who chose to run upstairs to escape the killer, these shades wont last long. 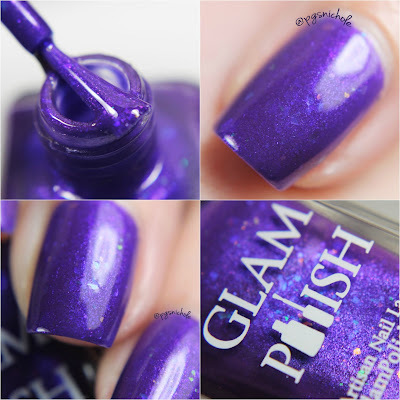 Why, Glam? WHY?? I'm trying to be better with my polish purchasing and you are NOT HELPING. but if you buy nice polish, it doesnt count right? All of these are gorgeous, but Alien is my favourite! Im partial to that one too. 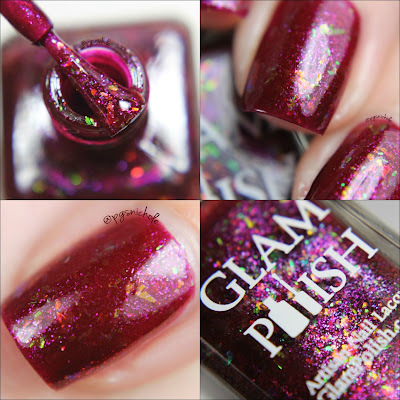 Alien and Vampyr are gorgeous!!! I wish pictures would capture them better! Oh my gosh Exorcist is freaking spot on! Talk about nailing that inspiration! right! Even my husband said "yeah, that totally works." Vampyr and Alien are AMAZING. Just perfect! Love your swatches. Gaahhh these swatches are gorgeous! I need Alien! Psycho is my FAVORITE! I grabbed a bunch at the launch! Yay! I can't wait to see your pictures! Oh wow, these are insanely beautiful! Scream is my favorite! So yeah, I bought the full 15 piece collection. Flakies are my poison and I fail at adulting. These are worth it. Promise. These are lovely, but none are making me feel like I HAVE to have them. Which kinda makes me sad. awww. That breaks my heart. 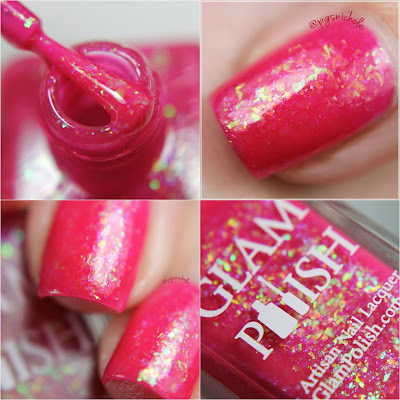 Ooooohhhhhhh *shudder* *drool* these polishes though. Oh my gosh. I haven't seen something that I've reacted this strongly to in ages. Vampyr omg those huge flakies. 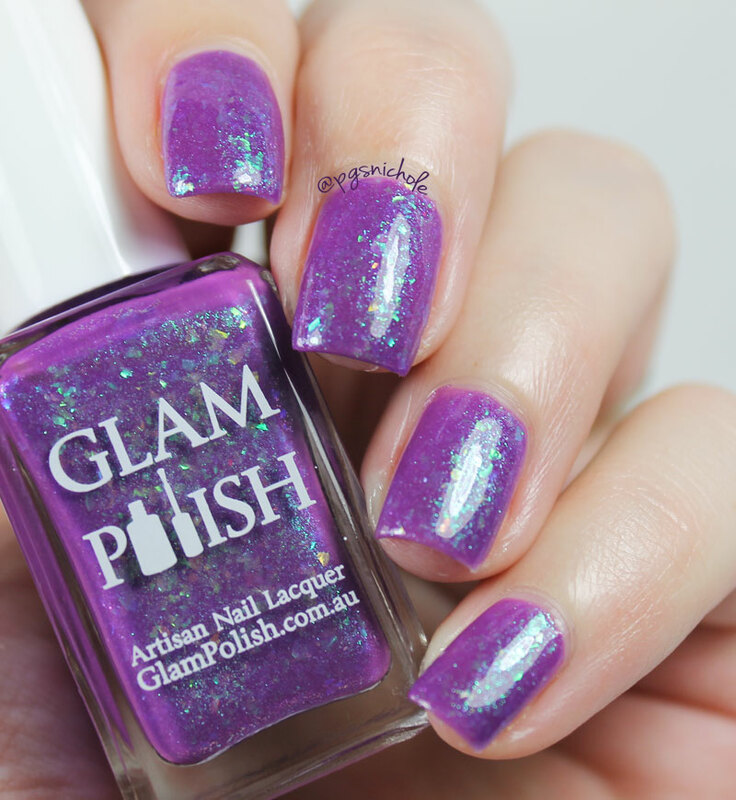 Alien is everything I've ever wanted in a nail polish ever. I'm on a strict strict no buy. But....these. Maybe just the two? I think Limited Editions are excluded from No-buys...right? Sweet Jesus!! Those will be my first Glams.